Motorola Droid 3: Coming Soon? Verizon 4G Phones: HTC Thunderbolt or Droid Bionic? The phone that helped turn Android into a household name may soon have a sleek new sibling. A fresh set of leaked images is fueling speculation that Motorola's Droid 3 smartphone could be nearing its release. The images popped up on the site of a mobile phone parts dealer this week and were spotted by the gumshoes over at Droid-Life.com. The photos show a phone similar in design to the original Droid and the follow-up Droid 2 and Droid 2 Global -- but with some notable improvements. The device depicted has a 4-inch screen compared to the previous models' 3.7-inch displays. It also gains a front-facing camera and an updated design, with a flatter and more uniform front. So is this really the Motorola Droid 3, and will we really see it anytime soon? At this point, your guess is as good as mine. There's certainly no official info from Verizon or Motorola yet -- heck, neither company has even acknowledged that the phone exists -- but this latest leak does match up with previous clues about the device. 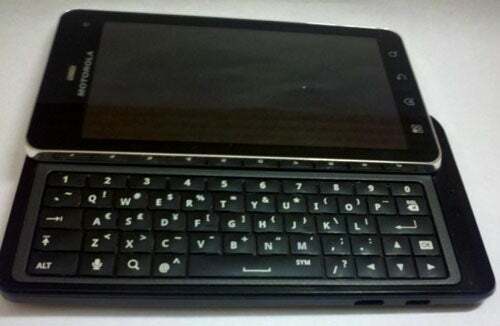 Back in March, someone posted photos of a phone said to be the Droid 3 to Howard Forums, a popular mobile user community. Those images look very similar to the new ones found today. One of them shows a revamped QWERTY keyboard with five rows, including one dedicated exclusively to numbers. In February, meanwhile, tipsters told Android blog Phandroid.com that the Droid 3 would feature a 4-inch screen with 960-by-540 resolution. They reported that the phone would launch sometime in the second quarter of the year -- in other words, within the next two months. Consider, too, that many owners of the original Droid are about to become eligible for handset upgrades. With Verizon's typical two-year contract -- which actually allows you to upgrade after 20 months -- anyone who bought the first Droid when it launched in November of '09 would be able to get a new discounted phone this coming July. Given the popularity of the original Droid, it'd certainly make sense for Verizon to launch a similar but significantly improved model around that same time. For now, though, we're left with more questions than answers. Will the Droid 3 have a dual-core processor? Will it ship with Android 2.3, aka Gingerbread, or will it follow in the footsteps of phones like the T-Mobile G2X and ship with Android 2.2 and an upgrade promise? Or, heck, could it be the first phone to launch with the next version of Android -- the one we think will be called Ice Cream Sandwich? You never know. Then there are the slightly geeky burning questions that could make or break the Droid 3 for many original Droid owners: Will the phone run an unmodified stock version of Google's Android software? And will it feature an unlocked bootloader -- a distinction that allows power users to gain administrative access and make advanced modifications? For now, my friends, all we can do is watch and wait -- and hope.